The Friends of Claudio Chiappucci are organising a cyclosportive event with the participation of the great Italian champion CLAUDIO CHIAPPUCCI who will accompany you on the course along with other great former professional racers. 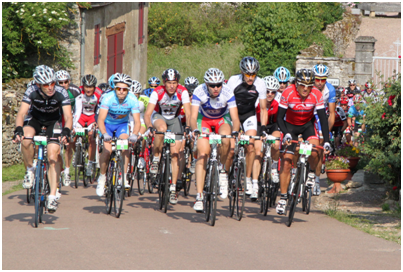 This year, there will be 3 cyclosportive courses and 1 cyclotourism course. A prize for the top 3 in each category. The scratch race winner of the Chiappucci (161 km) will receive their weight in Burgundy wine. Register with the Arnay-le-Duc Tourist Office by calling 03 80 90 07 55. You may be reimbursed for your registration fee upon submission of a medical certificate stating you are not able to participate in the event. Reimbursement requests must be sent to Les Amis de la Claudio Chiappucci / Office de Tourisme 21230 Arnay le Duc and postmarked before 1st June 2015. No registration confirmation will be sent to the participants’ home addresses. By registering, the participants’ rights of image and personal details are granted to the organisers. Discover this old medieval city through its heritage (the former Saint Pierre hospices, the 12th century tower of Motte Forte, the castle of the Princes of Condé, the stately home Maison Bourgogne), its history (the old carving shop, the 1st battle and victory of Henri IV, the route of Zarafa, the giraffe given to Charles X), its gastronomy and festivals.